Article from the Ayrshire Post June 21st, 2002 Click on the images below for full size photos. A bowl for 'Mr Maybole' - David Kiltie Bouquet for David Kiltie's wife Margaret, as daughter Frances, Councillor Andy Hill and community councillors look on. IT’S easy to take someone for granted —particularly when he becomes as familiar a fixture in the community as David Kiltie is in Maybole. But Maybole Community Council was determined to let David know how much they value his incredible 25 years service. Chairman David is the only original member still on the council, and his community service goes back even further — to Maybole Town Council. Vice-chairman Peter Mason paid tribute to David’s outstanding commitment to the town. So too did South Ayrshire Council leader Councillor Andy Hill. 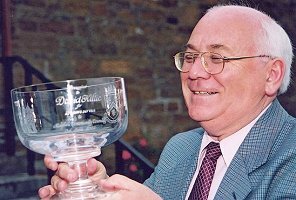 And there was a surprise for David when daughter Frances, on behalf of the community council, presented him with a commemorative glass bowl. Frances is the council’s youngest member, and she handed over a bowl which bears the community council’s coat of arms. Maybole Town Hall is also etched on the glass, with the words ‘Your Second Home’ underneath! David chairs local job trainers May-Tag and Maybole Community Development Group, as well as the community council. One of the most rewarding aspects of his community council work in recent years has been the success of the Maybole website — so much so that www.maybole.org attracts hundreds of thousands of ‘hits’ every month. Internet surfers from all over the world have been logging on for details of the town. 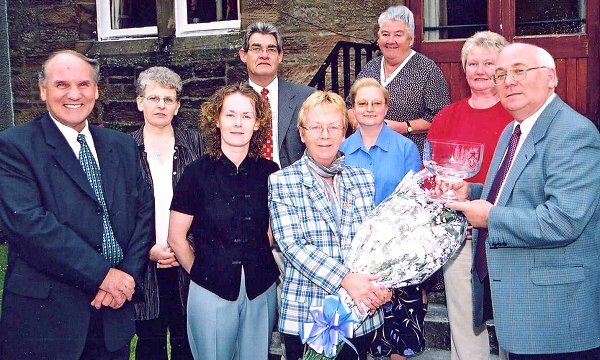 David is also a JP and has been involved in Maybole’s town twinning movement since the very start, 20 years ago. 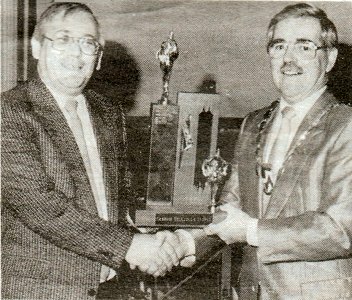 David Kiltie was named Citizen of the Year in 1989. Click on the image to the left to view full size. 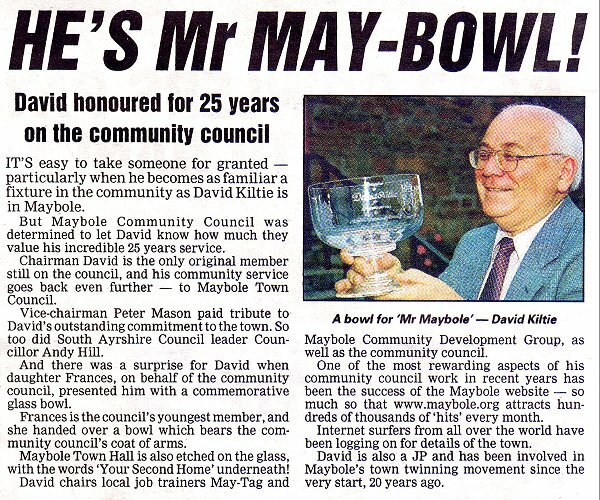 See also another article which appeared in the Ayrshire Post in December of 2001 honouring David's service to the community.